For many consumers – younger consumers in particular – text messaging has become a preferred way to not only communicate with one another but also to hear from brands they love. This is reflected in the well-published fact that 90% of SMS messages are read within 3 minutes. Interestingly, despite nearly universal adoption, the SMS communication standard hasn’t changed much since the first text message was sent on December 3, 1992, over 26 years ago. While initial adoption has been slow, strong support from equipment manufacturers, carriers and platform providers is poised to make 2018 the year that marketers need to care about RCS. 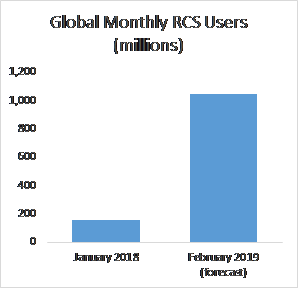 According to a February 2018 OpenMarket study, global monthly active RCS users are expected to grow from 159 million in January to 1.05 billion by Q1 next year, a 560% increase! Already, innovative brands are finding new ways to connect with customers and make their lives easier. 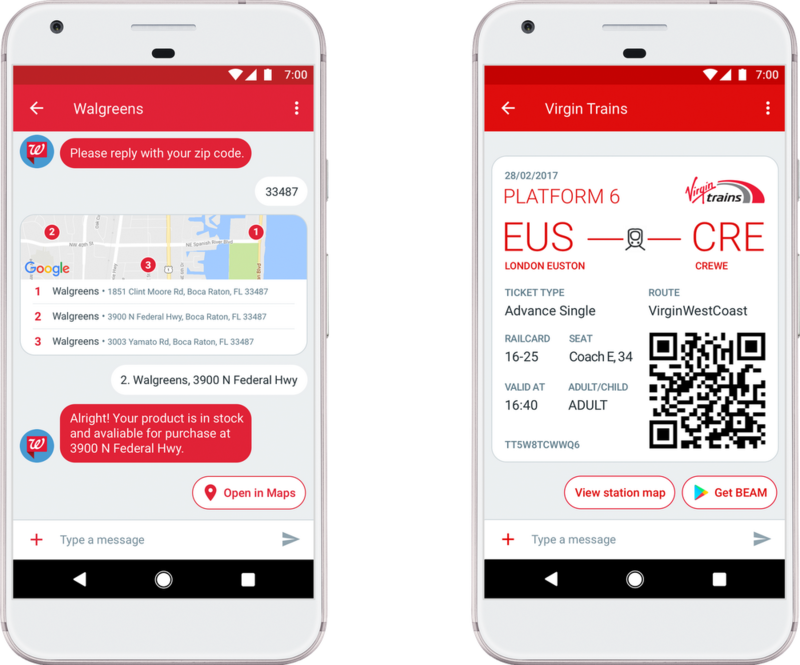 For example, in the UK, Virgin Trains is kicking off use of RCS to deliver mobile boarding passes directly within the RCS conversation and without having to click on any additional links. In addition, through easy quick responses, users can navigate train stations, download their app, change seats, and even upgrade their tickets. Walgreens allows customers to conversationally check inventory of the product they’re looking for in their local store, and then easily navigate there. Subway is supplementing its successful SMS program by testing into rich offers via RCS – again, directly within the conversation – from which they’re already seeing incremental traffic and sales in their restaurants. They are continuing to aggressively test even more interactive uses of RCS, include fully customizable food ordering and payments directly within customer conversations. Confirm that your SMS signup process is already fully compliant with the TCPA and other relevant regulations and best practices. As part of this, ensure you have clearly articulated all relevant disclosures and received prior written consent from subscribers. Consult your counsel for additional details. Work with your mobile provider to identify which members of your SMS audience qualify for RCS, and develop. While the standard’s adoption is growing quickly, not every carrier, platform, or device supports it. From the RCS-eligible audience, you will want to consider creating test and control segments. During your first few RCS campaigns, send the enhanced rich content to the test group, while sending an equivalent message via standard SMS to the control group. Measure the response (looking not only at click behavior, but also ultimate conversion) difference between the two groups to understand the incremental benefit of RCS for your program. Don’t chase the shiny penny. RCS offers a ton of exciting features, but don’t get distracted by all of the fancy bells and whistles. Instead, focus initially on one or two features that make the most sense for your brand. For example: If you’re trying to drive visits to a store, then a map integration might be just the guidance you customers need. If you’re trying to drive product discovery, a carousel is a great way to present a range of items in an interactive, digestible way. Add a quick action to allow easy conversion, as well. Focusing on customer service? A rich chat experience where you can also share photo and video product instructions can really create a high-touch interaction. Use your audience data to personalize content. Remember that this remains an addressable channel, meaning that you have the opportunity to directly address any customer or audience member that you can identify. Even better, use everything you know about that recipient to personalize the experience. Was a guest browsing properties in a particular destination? Make sure you fill them in on the latest amenities in that location! Know that a particular customer was browsing a particular clothing style? Show them both great alternatives as well as fashion-forward complements to what they were looking at. Ensure you’re integrating RCS communications with messages that the recipient is receiving in other channels. Remember that mobile messaging, including RCS, is just one more tool in your arsenal. As rich as these experiences may be, it’s how you deliver a combination of the right messages at the right times across the right channels that will differentiate your marketing. Consider orchestrating your communications across channels. Send an email, perhaps, and then follow it up with different RCS message content depending on how the recipient interacted with the email content. With its ability to create rich, engaging experiences with customers while they’re on the go, RCS messaging may be just the brushstroke you need to complete your marketing masterpiece. To learn more about how Epsilon can help integrate a rich mobile messaging strategy into your broader marketing efforts contact: DigitalCX@epsilon.com.